Despite valuable progress, tuberculosis (TB) remains a major health problem in prisons. Within the WHO European Region, reported TB cases among prisoners are up to 30 times higher than in the general population; people in prisons are more likely to die from TB and less likely to be cured of the disease. 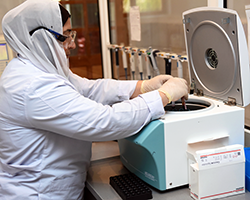 But, in Azerbaijan – a country bordering the Russian Federation, Georgia, Armenia and Iran – a dedicated programme has helped to dramatically reduce rates of TB infection for prisoners and has bolstered treatment outcomes. Building on this success, the country is now home to the world’s only WHO collaborating centre specializing in this subject: the WHO Collaborating Centre on Prevention and Control of Tuberculosis in Prisons. Since its establishment in 2012, it has hosted more than 200 trainees from around the world who have visited specifically to learn from Azerbaijan’s experience. Within Azerbaijan’s prison system in 1995, less than half of TB patients successfully completed a full course of treatment. This increased the risk of complications for individual patients, as well as for wider transmission of the disease. Many prisoners lost their life as a result. Today, outcomes are very different. Cure rates are over 90% for detainees on first-line medicines, and more than 75% for those on the second-line treatment, while they are around 100 times less likely to die from the disease. This follows implementation of an ambitious programme to strengthen TB prevention and control within the justice system, supported by the International Committee of the Red Cross; the Global Fund to Fight AIDS, Tuberculosis and Malaria; WHO; and other partners. In addition, the country is exceeding WHO targets for treating more complex drug-resistant cases. “An extensive government-led programme and strong collaboration between the health and justice ministries, with civil society and our international partners has strengthened the TB programme in prisons, and helped deliver strong patient-focused care across the whole of the penitentiary network,” says Dr Natavan Alikhanova, TB Coordinator within the Main Medical Department of Azerbaijan’s Ministry of Justice. While the Centre was initially oriented towards the post-Soviet countries, a highly effective TB control programme in prisons is more and more attracting study participants from around the world. Since its creation, delegates have visited the WHO Collaborating Centre in Azerbaijan from almost all eastern European and central Asian countries. Increasingly, delegations are also attending from nations further afield, such as China, El Salvador, Iraq, the Philippines and South Africa. Tailored for different groups and targeting clinical as well as non-medical penitentiary staff, the training agenda is based on up-to-date recommended WHO approaches. Through lectures and field visits, it covers the core aspects of Azerbaijan’s programme and especially the practical experience of tackling drug-resistant TB. In addition, 18 tailored study tours have also been organized for 120 participants, representing Ministries of Internal Affairs and Ministries of Health from countries inside and outside of the region. “Despite being preventable and curable, TB threatens the health of many detainees around the world, who too often face discrimination in terms of access to quality health-care services,” says Dr Masoud Dara, Coordinator for Communicable Diseases at WHO/Europe and Chair of the TB Control in Prisons Working Group of the International Union Against Tuberculosis and Lung Disease. In line with implementation of the Tuberculosis action plan for the WHO European Region 2016–2020 and the WHO End TB Strategy and through trainings, assessments, policy analysis and technical advice, WHO/Europe supports Member States to strengthen the provision of health care for prisoners . Effective TB prevention and care in prisons is crucial for achieving health for all, and protects prisoners, staff, visitors and the wider community from transmission of the disease.